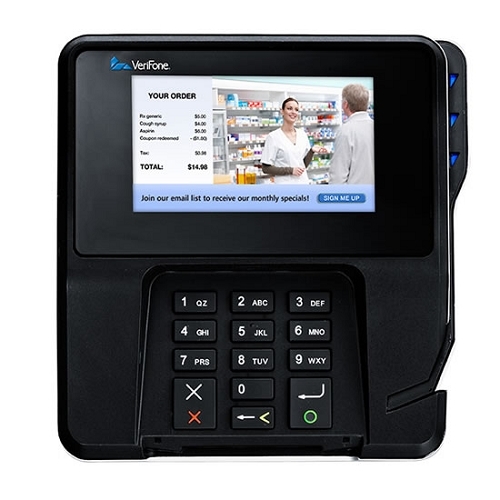 VeriFone’s MX 915 device delivers a rich media experience with a 4.3? color display, powerful processor and generous memory. The MX 915 is NFC enabled and supports full motion video. – High-speed graphics processor and generous memory help bring customer messaging and video advertising campaigns to life – Crystal clear, 4.3? flush mount display – Clean lines and modern, sleek design make a powerful statement – State-of-the-art stylus for a clean and sleek look – Chemically-hardened screen – NFC/Contactless support to quickly capture new markets as they evolve – Large screen area accommodates optional signature capture along with scrolling account activity, branding and promotional offers.